The Photos Below are from Dale E. Price who was a personal friend of Gail. My wife and I were personal friends of Gail until she left us at an all too early age in 1997. There are numerous stories out there on Gail Davis that have appeared in print I hope you will enjoy this little short piece about our dearest friend, whom we continue to miss, but she lives on in her many wonderful films. This short article doesn't scratch the surface, but hopefully it will give you another insight into GAIL DAVIS. Although Gail Davis (Betty Jeanne Grayson) was actually born in Little Rock, Arkansas, her family lived in McGehee, 108 miles south of the state capitol. McGehee did not have a hospital at the time of Gail's birth. Later Gail's Father Dr. William B. Grayson, prominent surgeon, built the first hospital in McGehee. Gail was the first of her family to enter the theatrical profession. Her Mother had studied singing and had a fine contralto voice which Gail inherited but the only experience her Mother had before an audience was in the church choir of the First Baptist Church. Gail studied dancing for over twelve years beginning when she was two years old. She also studied singing. When Gail was two; her father became the Arkansas State Health Officer and this necessitated the family's moving to Little Rock. There Gail grew up, the only girl in her immediate neighborhood. Therefore at an early age she learned to climb a tree, ride a horse and run and jump as fast as her young playmates. She was, she confessed, something of a tomboy. She had to be or be left out of everything. Since at the age of two was chosen the Most Beautiful Baby in Arkansas, it is easy to see why, in addition to her athletic prowess, she was wholeheartedly accepted by her male playmates. Gail attended grade school in Little Rock and Little Rock High School, Hakum Junior College for Girls in Bryn Mawr, Pennsylvania and the University of Texas in Austin where she became one of the famed Texas Blue Bonnet Belles and garnered many beauty titles during her high school and college careers. Gail's experience with audiences came first when she appeared in the local recitals at dancing school in Little Rock. She was active in dramatics at Harum and at the University of Texas. She participated in camp shows for the military stationed in the vicinity. While appearing in one of these camp shows in Texas, she was introduced to Gene Autry, then in the Army Air Force (AAF) Gene was impressed with her ability and good looks and told her that should she ever find herself in Hollywood to look him up. 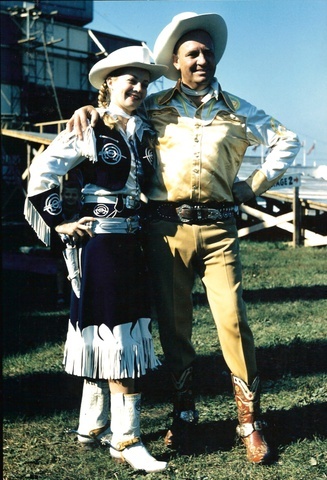 A year later, when Gail and some friends decided to try their luck in Hollywood, she got in touch with Autry at Columbia Pictures where Gene was making feature length movies and after extensive testing he pronounced her a "perfect Western type" and cast her as his leading lady in "Cow Town." Fan response to her appearance in this film was tremendous, more than that garnered by any other Autry leading lady. She appeared with Gene in 14 feature length motion pictures and in 15 of his television films. Through these activities, Gail acquired a large and loyal following of fans. Gail paid her dues by appearing in many bits parts at RKO before being co-starred with Roy Rogers, Allan "Rocky" Lane, Monte Hale, Charles "Durango Kid" Starrett, Kirby Grant, Johnny Mack brown, Jimmy Wakely, Tim Holt as well as many others of that era. She was always in demand and appeared repeatedly in almost all of the popular TV western shows of the day. For many years Gene Autry had entertained the idea that a Western heroine properly conceived and cast could be as popular with fans of outdoor drama as any male counterpart. In the legendary character of Annie Oakley he believed he had found his heroine. In creating Annie's screen counterpart Autry conceived as an attractive crusader with stout heart, quick wit and wholesome natural good looks. In addition to an appearance and personality which would make her believable in the role, the girl who played Annie had to be an expert rider and, like the original Annie (Phoebe Moser of Greenville, Ohio), possess exceptional ability at handling a gun. When Gene Autry was ready to try his idea on film he sent out a call to every possible source of talent in Hollywood and New York. Extensive tests were made. Gail, hearing of the project, asked that she be allowed to test. Gene was at first reluctant, he wanted a complete unknown for the role. Finally he consented and Gail walked away with the part. Gail was the screen's first out and out western she-male star, the first cow gal ever to get billing over not only the men in her casts but the horse as well! As Annie she pays off the mortgage on the old homestead, catches the rustlers, out-shoots the villains, saves the hero from horrendous fates and rides off into the sunset alone at the end of each picture. Though she does a man-sized job of shootin', ridin' and cliff hangin' in the course of each episode, Gail's Annie was feminine through and through. She was a little mother to her TV kid brother, Tagg, played by Jimmy Hawkins. She is often shown cooking, sewing or primping. She had a sort of "understanding" with Lofty Craig (Brad Johnson) the stalwart deputy sheriff who shared many of her adventures. Once she blacked the eye of a raven-haired wench who was making a play for Lofty. She did it while wearing a dainty flower trimmed hoop skirted gown in a dance scene. Of course the wench turned out to be the villainess of the story, too, so Annie's attack was justified-on a double count. In person Gail talked in a pleasantly deep contralto voice. She was quite mannered and very easy to look at neatly encased in the handsome Annie Oakley clothes. All of Annie's outfits were especially designed by her sister, in western style featuring split skirts and boleros with blending shirts. Fringe trim was used extensively as were nail head and jewel adornments on some of the more elaborate costumes. Annie's hats are white roll trim brim Stetsons. Some are plain with contrasting bands for trim, others are decorated with jewel of sequin medallions scattered about crown and brim. The decorated hats were worn with her fancier personal appearance outfits. Gail learned to ride as soon as she could sit on a horse and since her father liked to take her on hunting expeditions, she became an excellent shot at an early age. However, she was too softhearted to be much of a huntress. Almost paralleling one of her Annie Oakley TV plots, Gail as a child saw a wounded rabbit and was so touched by the pitiful sight that she lost any taste she might have had for the sport. She was an excellent swimmer, played tennis and enjoyed golf - she was an all around athlete. One of the aspects of the Annie Oakley assignment which she enjoyed most was being on location, keeping her outdoors an average of 80% during each film schedule. Gail recorded and was under contract to Little Golden Records, RCA and Columbia, adding an extra facet to her already busy career. Between film assignments she maintained a multi-city schedule of personal appearances each year. These tours have taken her to England, Canada and over forty different states where her winsome beauty and warm friendliness added a legion of fans to Gail Davis. ever increasing number. Among her many achievements, includes three different Billboard Awards for "Best Performer" in a Western Television Series, The "Golden Boot Award" as well as her own "Star" on the Historic Hollywood Walk of Fame. Gail enjoyed attending film festivals throughout the country and meeting all her loyal fans. At the Knoxville Film Festival in 1990 over 500 fans were lined up at one time to get her autograph and have their picture taken with her. During the three day event she signed well over 1000 autographs. Gail, (Mrs. Betty Jeanne Guerriero) remaining a widow for several years, after Carl her husband of many years passed away, lived in North Hollywood until she left us to join him on Saturday, March 15, 1997. In the eyes of many, this Arkansas girl will always be "Annie Oakley." This article is for the exclusive use of Stanley Rojo and the Rojo Archives with permission to be used on his Website. Dale E. Price, Fairfield, Ohio, April 19, 2008. 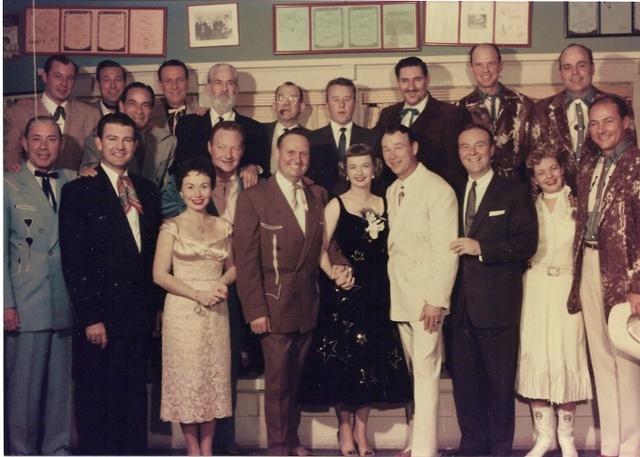 (left - right) 1st Sons of the Pioneers, 2nd Tex Williams, 3rd Connie Haines, 4th Gene Autry, 5th Dale Evans, 6th Roy Rogers, 7th Ralph Edwards, 8th Gail Davis, 9th Cass County Boys. (left - right) 1st Sons of the Pioneers, 2nd Sons of the Pioneers, 3rd Sons of the Pioneers, 4th George "Gabby" Hayes, 5th Unknown, 6th, George Gobble, 7th Pat Buttram, 8th Cass County Boys. 9th Cass County Boys.